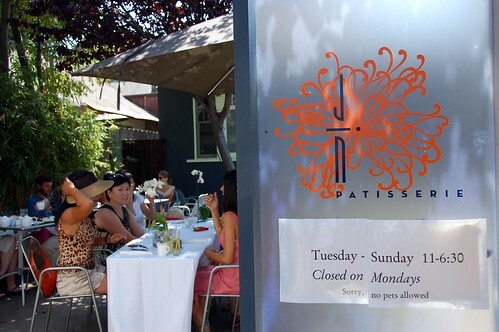 On Sunday, we stopped by Jin Patisserie. I love the place (especially their tea), but they're quite the photo Nazis when it comes to the little bungalow. I wasn't allowed to snap inside. Poo on them. We came home with this. 12 macarons for $17. Steep? Not compared to Bouchon, Payard, or even Bottega Louie. We were very happy to have duplicates of hazelnut and tea. They were two of my favorites. My top fave was probably pistachio, but I am generally in love with anything pistachio-tinged. All the macarons were so light and delicate with impeccable cream fillings. They weren't just different colors. Their flavors were absolutely distinct. Bottega Louie is a distant fifth, but it deserves a mention because it's so close to us. What do you think? 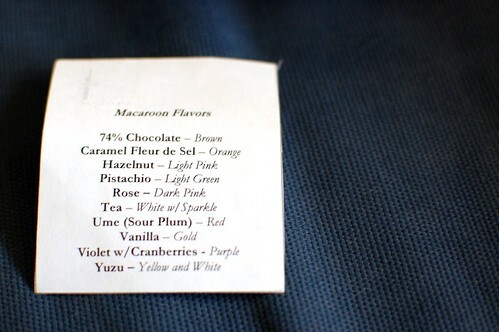 And, if you've been to Paulette, how do their macarons compare? What other macarons do you like in the Los Angeles area? Enlighten me please. Rivers - The macarons at Euro Pane in Pasadena are pretty decent. The caramel sea salt one would be phenom if the salt crystals were better dispersed (http://gastronomyblog.com/2009/01/11/euro-pane-bakery-pasadena/). They're also livin' large. I say, try em just to rank em. The colors of the macaroons were so amazing and I can't believe that they won't let you take photos in the patio. That seems so silly. Bottega Louie's were just OK. Patisserie Chantilly just OK. Some place in SF Ferry building was too chewy and dense. The macarons at the chocolate buffet at the Sofitel in Saigon were just OK. La Boulange in SF were just OK. But Paulette's. Even my sister, who's not a big fan was wowed by Paulette's. Delicate and flavorful. I finally got the appeal of macarons after eating two. Mind you, this was a freebie in a goody bag so I don't even know how old it wasn and haven't actually been to the shop, but they were still the best I've had. ugh, I hate it when places are photo Nazis. The only place I got yelled at was a chain deli... come on now. 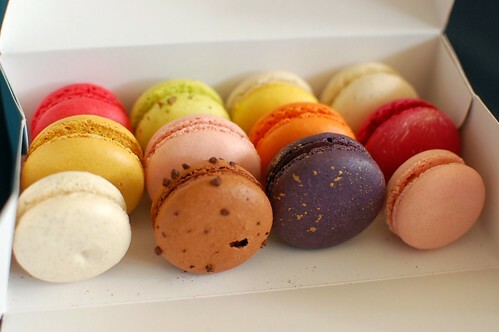 i have a confession to make to you...i've never eaten a macaron. I too seem to spend a ridiculous amount when it comes to macarons - only ridiculous in the idea that something so small can cost so much. beauteeful. i've got to check out jin p. i heard the flavors are subtle. i agree that b. louie macs suc. they suc! hehe. It all looks so pretty. 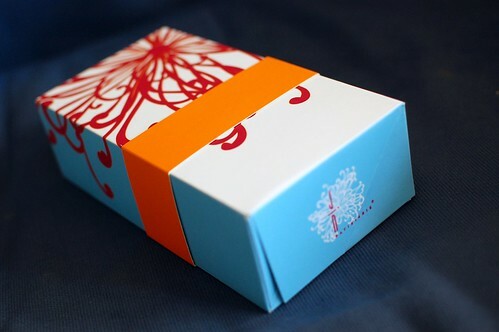 I love the box and the macarons look gorgeous too. I could probably eat the entire box in one sitting, lol. So gorgeous!! This place and Louie are on my must-hit list. A rainbow of macarons! Delightful. I would like to participate in a macaron hopping excursion. i think i like paulette's better than jin, but like i said, it's been awhile since i've had jin's. paulette's flavors are really great--their pistachio is fragrant. you'd like it, i think. i didn't like euro pane's as much...did you? LOVED the size, though. i must try these some day. My sweet tooth is practically crying for them. so pretty! and paulette's is close to you...don't walk, RUN! Vanilla Bake Shops are tasty, but I think they are on the small side. Bouchons are hit or miss, some are too sweet IMO. My mom is in NYC right now and I need to do some research so she can bring me some home! I've been to La Duree it's amazing!!! I don't like macaroons so much but they were beautiful...and all of their pastries are to die for. I have never had macarons, but I do love pistachio-flavored things so. Those are the cutest things ever! Ok don't kill me, but I thought macaroons were a coconut cookie. Are these different versions of coconut cookies? I'm confused. Also, I really need to try these. I'm pretty serious about this. I saw them on Tater's blog before and was thinking the same thing back then. 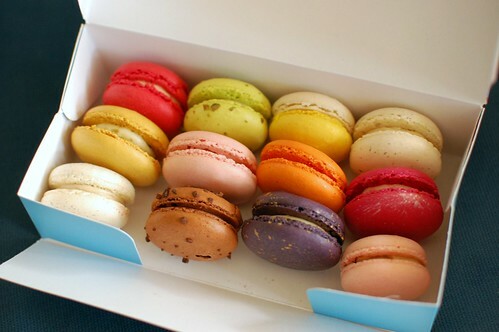 These are French macarons. That's why it's spelled "macarons." They are amazingly delicious light French cookies with a sweet cream filling. They come in all different flavors. Macaroons (with two O's) are nasty American coconut candies. Oh ok! Good to know! Well regardless, I need to try these. I'll be happy to accompany you to try a new place! Boule's were my favorite until they closed. Their dulce de leche flavor and seasonal egg nog were majorly swoon worthy! I do like paulette's though too. The vanilla tastes like a sugar cookie and the texture is far superior to Jin, Little Next Door and Provence Patisseries' macaron. I did like the pistachio macaron at Jin (my favorite of the ones I sampled), but overall, thought they were too small and a bit dry for my taste. I've never had a macaroon. Shhhh! Don't tell on me! Ai ai ai. I almost ordered Paulette macarons when we got back from L.A. $34 for the macarons and $36 for shipping. M, no. Oooh I was just telling Josh I want to hit up Laduree in December when we are in Paris! Those macarons make me long for Laduree again. Paris was such a fab trip. Unfortunately, I have been reluctant to eat any macarons for fear of forgetting the tastiness that was Laduree since our return. Lame. You MUST try Paulette. They are amazing flavorful for something so small and delicate. I usually take small bites w/ tea. Lavender, Rose, Wedding Almond, Rasberry and the chocolate. IMO BL are really hard. No bueno.